Cabbage you say? Yes and I can vouch that age 5 to 61 LOVE it in our house. The first thing Tommy asked me to make him when he came over after being gone to visit his dad for 5 weeks was this recipe. I already had something else in mind even though there were some leftovers in the refrigerator. It is sooooo easy to make and everyone in our family loves it. 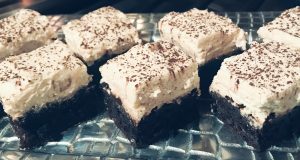 Tori shared this recipe with me when she was experimenting with slow cooker recipes. Last fall, we were on the hunt for great … not just good … low or no sugar, crock pot dinners for those nights when the kids have activities and no time to cook. 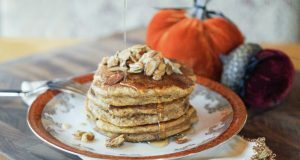 We could hardly believe how many recipes were out there that had LOTS of added sugar or were heavy on the starch. Tasting GREAT was harder to do. Of course I tweaked it a little bit and its been a winner ever since. We don’t even wait for school or cold weather. We eat it year round. • Coat the slow cooker/crock with room temperature butter. • Core and slice the cabbage in one inch slices and then cut those in half. • Trim off the top of the onion slice. Place cut side on cutting board and cut in half through the root. The root will help you keep the onion layers together and much easier to slice in thin pieces. Slice into thin slices. Add the cabbage and onion to the crock. • Mix the chicken broth, brown mustard, salt and pepper. Pour over cabbage and onion, tossing so that the cabbage and onion are well coated with the broth mixture. • Top mixture with sausage. • Cover and cook on LOW for 4 hours; give mixture a good stir, then cook 1 hour more. • This is so good! Enjoy! 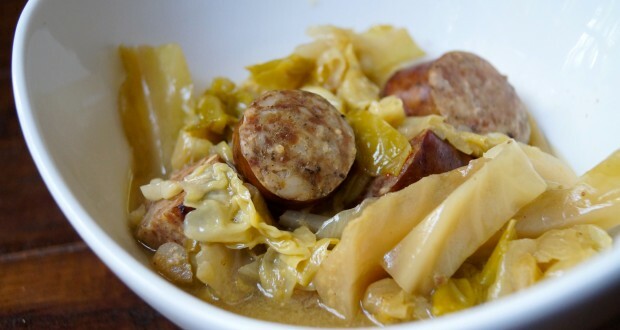 You can use your favorite sausage or kielbasa. If you like more onion then add it. I do! You don’t have to but I add the brown mustard, salt and pepper to the broth and mix before adding to the cabbage and onion. I actually left this in the slow cooker for Vic to manage when I left him home alone <grin> to celebrate his sisters birthday last week. Trust me, he didn’t stir it and cook another hour. I had the timer on for 4 hours and then it stayed warm until he was ready. 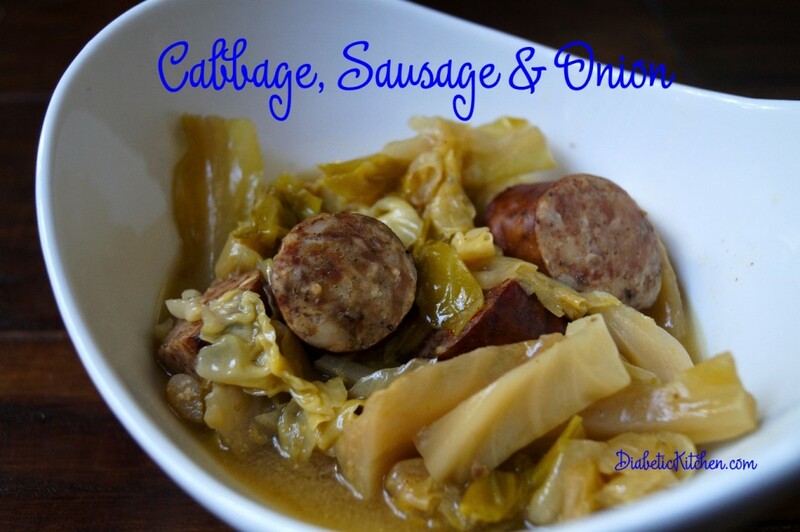 I do not like the cabbage and onions to be mushy so this works and its still got texture for leftovers later in the week. 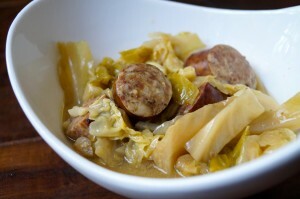 And yes, Tommy got his Sausage and Cabbage the next day for lunch! The picture is actually his bowl of leftover yummy-ness! I think after reading the nutritional facts about red cabbage I will make this next time with it. That would be colorful and healthier! I will post a picture when I do. Cabbage is low carb and high in fiber. Cabbage also is great for our brain health. Red cabbage has the highest amount of Vitamin K and anthocyanins that will help improve your defense against Alzheimers and dementia. Cabbage is good for the skin and helps detoxify the body. Cabbage is a cruciferous vegetable and we know they help in the reduction of breast cancer. It’s also high in potassium which helps blood pressure from getting high. The red color of red cabbage can regulate blood sugar and boost insulin production. Onions have a variety of health benefits. The phytochemicals in onions help improve your immunity. They contain chromium, which assists in regulating blood sugar. Onions have been used to reduce inflammation and heal infections. Use the juice of an onion for relief from a bee sting. A powerful compound called quercetin in onions is known to play a significant role in preventing cancer. 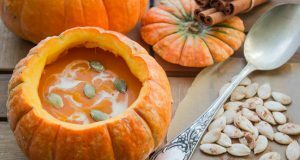 By using a low heat method to prepare onions in a soup, you can preserve the health benefits because the quercetin does not degrade. It simply transfers into the broth of the soup. So don’t throw away that broth! Drink it! Onions scavenge free radicals, thereby reducing your risk of developing gastric ulcers. Those bright green tops of green onions are rich in Vitamin A, so use them, don’t throw them away. This recipe looks delicious and would be very good for you. Looking forward to trying it. Tonight supper with purple cabbage..looks and smells great! Don’t leave me hanging robert, how was it?? ?